This morning, as we bid a fond adieu to little old February, I'll report last night's activities. I have not done a double-header for some time, so it was kind of interesting. First, I attended lame duck Assemblyman Allan Mansoor's Town Hall at the Costa Mesa Community Center from 6 - 7 p.m. Mansoor showed up about 5:55 and began the meeting before what turned out to be a full house - more than 130 people attended - just after 6. He wrapped it up promptly at 7 but stuck around to answer one-on-one questions. Mansoor led off with a preemptive strike of sorts by attempting to salvage his position on illegal immigration that had been brought into question recently when he - apparently too hastily - signed a letter supporting House Speaker John Boehner's position on amnesty for illegal aliens. Once again - for the gazillionth time - he told the story of his parents, who immigrated LEGALLY from Egypt and Sweden, but this time he threw his mother-in-law into the mix. She immigrated from Viet Nam. He complained that people had come to his office and berated his staff and shouted epithets at them and questioned their immigration status. 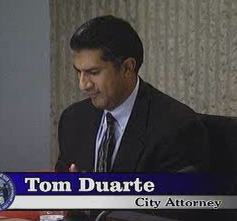 He reminded us that he, personally, was responsible for 1,300 illegal alien criminals being taken off the streets when he was Mayor of Costa Mesa. He spoke of the state budget, which Governor Brown recently declared had a $3.2 billion surplus. Mansoor was flummoxed that there could be a "surplus" when the state has a $354 billion pension liability. 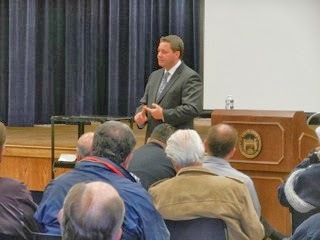 He mentioned "bad bills" that were being proposed briefly and without much detail. He mentioned his bills - which had not been passed. Nothing new here. He's so ineffective in Sacramento that his record of getting bills he originated passed is one (1) UNO! That one removed the word "retard" from the official state lexicon. The exodus of businesses from California (he doesn't like it and thinks we need to find new revenue sources to retain them) No, I didn't get that one, either. Crime up in Mesa North with slow police response times (he thinks we need to curb wasteful spending instead of raising taxes to pay for more police) He also mentioned Pensions as being unsustainable. He was asked about AB109 - the prisoner realignment scheme that shoved prisoners out to municipalities. (He said "Public Safety should be our number 1 priority", then said, "I'm doing the best I can with what I have". One very attractive woman - a lawyer, she said - thanked him for his help with Prop. 65 and heaped praise on him. (He said he was "humbled" by the praise. All in all I didn't learn much from the 55 minutes at that meeting, except that he's doing the best he can with what he has. I was reminded just what a feeble public speaker Mansoor is, and, even after a dozen years in public office, how he still can't seem to articulate his points without sounding like an echo of himself. 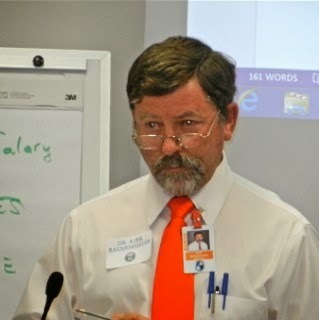 I will attend any debates/forums that pit him against Michelle Steel and other candidates in his run for the Orange County 2nd Supervisorial seat presently occupied by termed-out John Moorlach. I'll be hard-pressed to find a reason to vote for him, though. I then skipped over to City Hall to attend what was left of the Parks and Recreation Meeting, arriving just a half-hour before they wrapped things up. I missed both items about tree removals, but did hear the tail end of the report on the field use allocation study presented by the staff, HERE. The upshot is that we don't have enough of them, particularly lighted fields for youth sports teams. 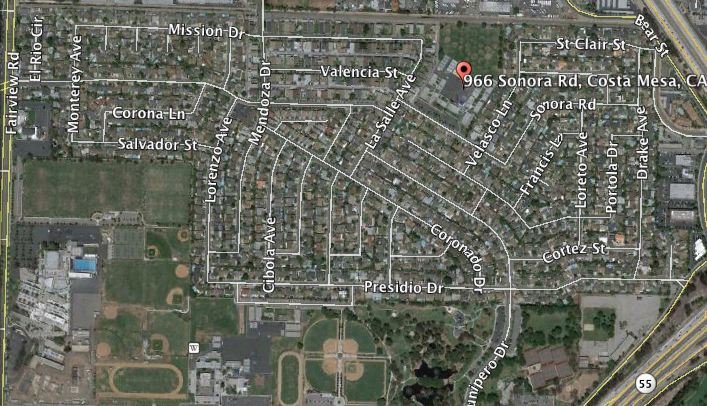 Mention was made about the possibility of acquiring/leasing the Balearic Center from the Newport Mesa School District. That meeting ended with two other residents in attendance just after 8:00 p.m. If you want the whole story read Brad Zint's excellent summary of the meeting published in the Daily Pilot, HERE. OK, so most of you have no clue who Gabriel Heatter was - he's the radio newsman who was a dominant figure when I was growing up. That title line was his signature line on his radio program and is seems VERY appropriate today. The big news is that Barbara Venezia is bringing her special skills back to the Daily Pilot! She is leaving the Orange County Register and returning "home" to provide a dose of wit, lots of tenacity and her own special style in a political column that will appear every Friday. HERE is her announcement. This is wonderful news for those of us who admire her ability to dig into issues, poke the powerful and present the story with a smile. I suspect there may be more than a few local politicians in our neck of the woods shuddering at the thought of that next telephone call from Barbara. I envision soiled trousers throughout the Newport Mesa. It makes me smile. A funny thing happened on the way to a Charter last night. As the committee headed for the home stretch after months of diligent, tenacious and sometimes heated discussions during which polar opposite viewpoints seemed to drift together and much progress had been made, the whole process was hijacked! 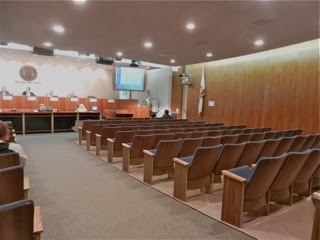 At the first meeting in months where all the committee members were present and at what was supposed to be the next-to-last meeting of their process before their work product - a Charter for the City of Costa Mesa - was to be presented to the City Council, the true colors of some of the players around the table finally surfaced. After facilitator Dr. Kirk Bauermeister and his sidekick, Dr. Mike Decker, got the committee off and running in what certainly looked like a productive evening when they promptly dispatched with Jim Righeimer's Paycheck Protection scheme and Eminent Domain as unworthy of being placed on a Charter, I thought they might actually have a chance to produce a document within their schedule. Now I'm not so sure. 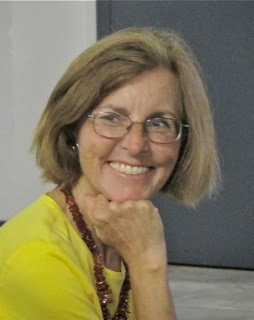 Just before 8:00 member Andy Smith turned the discussion to lawyer Kimberly Hall Barlow and suggested that she and fellow-lawyer Yolanda Summerhill might wish to provide the committee with "guidance" about what they might be missing in a Charter document as the headed for the finish line. This was a stunning development, since it has been understood from the beginning that the staff, including the lawyers, were there to provide technical/legal advice to the committee - to help them produce a document that was legal in form and format - NOT to provide input on the content of the document segments. The members of the committee have had at their disposal from the very first meeting copies of many other charters from which to glean ideas for inclusion in a Costa Mesa Charter. It's going to be very interesting to see how Barlow and Summerhill play this one. 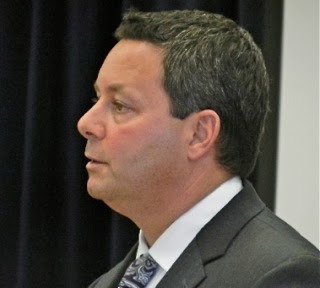 Another late-in-the-game curve ball was generated by member Gene Hutchins - who continues to be unable to get beyond the Unfunded Pension Liability issue - when he tossed into the mix some lengthy language regarding Pensions that had been conjured up by the Pension Oversight Committee, of which he is also a member. Based on the brief discussion last night, this item is likely going to take an hour or more to flesh out at a time when the committee expected to just be polishing their final document. 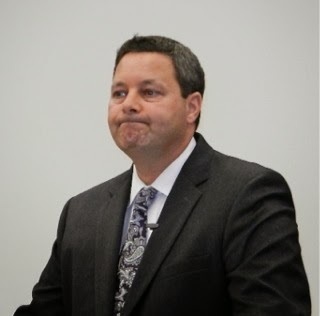 GRAVE ROBBING However, the biggest surprise/disappointment came when Smith - did I mention that he and Mayor Pro Tem Steve Mensinger used to share a cubicle at Arnel Development? - reached down into the grave and attempted to resurrect Measure V, Mayor Jim Righeimer's failed Charter from the 2012 election. Although they've had more than six months to tinker with that document and other charters, this attempt to bring back that document from the dead was a shocker. It all began simply enough, with a request to carve out the verbiage from Section 201 (e) Qualifications for City Council members and include it in their Charter. 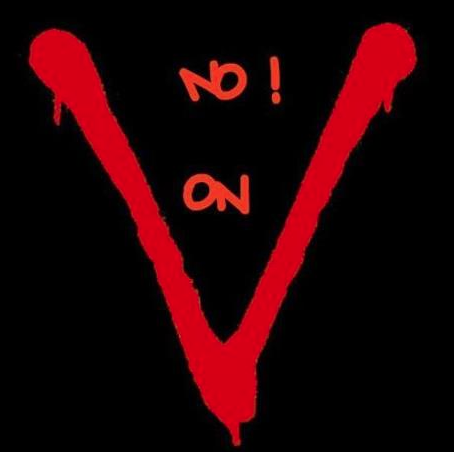 There seemed to be unanimity on that subject when, all of a sudden, then the whole thing took on a life of its own and now the committee will be pouring over Measure V with an eye to plugging items from it into their Charter! This is more than a curious turn of events. Unless there are serious politics at play here, why would they attempt to dredge up a document that failed convincingly at the ballot box - nearly 60% of the voters rejected it? There is only one answer - that the Righeimer/Mensinger appointees on the committee have waited until the very last minute to spring this on the committee and facilitators to force the process to hastily consider segments of that document with the hope of jamming them through onto their Charter due to severe time constraints. Well, let me tell them that it won't work! Sure, they can go ahead and try it and, perhaps, even get much of it included as their fellow committee members run out of gas. But, the community didn't support Measure V and I doubt very much they will support "Son of V", either! No, this is going to be just one more example of where the cabal that controls this city is too clever for it's own good. In two weeks, March 12th, the committee will meet again in Conference Room 1A, starting their deliberations earlier than usual - at 5:00 p.m. - and will work late if necessary to finalize their document. It's going to be VERY interesting to watch this little soap opera evolve. This evening Bradley Zint in the Daily Pilot published his account of the recent attrition/hiring reports for the Costa Mesa Police Department released by the City of Costa Mesa last week, HERE. This comes on the tail of my initial account last Friday, HERE, and Eric Hartley's four articles in The Current this morning, HERE. Zint links to the Daily Pilot story from last August that first addressed the hiring difficulties the CMPD was having. He also provided statistical analysis of the departures and hiring numbers. And, of course, he has provided us with some memorable quotations by some of the main players in this drama. 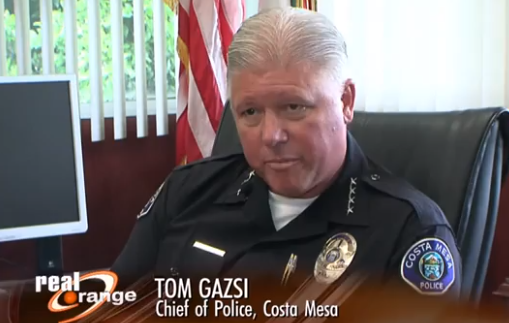 For example, early on in his piece he quotes Costa Mesa Police Chief Tom Gazsi, addressing the recent spate of departures, as saying, "A number of these folks have left because of the contentious environment and a difficulty in predicting a future for their families and a career". Gazsi went on to say, "They're seeking agencies where there's a breadth of assignment opportunities available to them, as well as development and advancement." Mayor Jim Righeimer, clearly out of touch with the issue at hand, is quoted as saying, "It's unfortunate that some of the rank and file somehow think that the city is somehow going to take away benefits or something they already have - which the city is not going to do". In NONE of those statistics provided was there a single individual who said they left because of a fear of diminishing benefits - NOT ONE! At the end of the article he accuses the men and women of the CMPD with extortion for the alleged placement of a tracking device on Mensinger's truck. 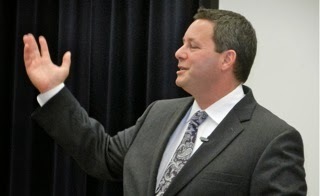 Hmmm, I wonder what those miscreants who allegedly placed that tracking device were hoping to extort from Mensinger? So far, there has been no proof offered that anyone associated with the CMPD or the CMPOA had anything to do with the placement of a tracking device on any one's car. So, the drama continues. I suspect Righeimer, Mensinger and CEO Tom Hatch must be feeling a little like they're part of a big pinball game, getting batted from post to post, never really knowing where the next slap is coming from. I understand there may be a decision by the judge in the bogus lawsuit sometime next week as to how it will proceed - or not. Today in The Current, the Orange County Register's supplement that serves Costa Mesa and Newport Beach, there is a series of articles by ace reporter Eric Hartley that will add fuel to the already out-of-control controversy about staffing of the Costa Mesa Police Department and the relationship between the department and top elected officials in the city. The article, which is tucked safely behind the Register's damnable pay wall, can be found HERE if you're a subscriber. If you are NOT a subscriber, get up and go find a copy of The Current right now! *NOTE: I found another link that works better, HERE, although all the stories kind run together. At least you'll have a way to comment on it(them). Grrrrr! That should give you an idea of the tone of the articles. The "Ghost town" article begins by profiling recently-departed officer Kelly Benjamin, who took a 23% pay cut to join a smaller police agency in Los Angeles County. Benjamin is but one of the many officers who have left the Costa Mesa Police Department over the past couple of years. I wrote about that at length last week, HERE. 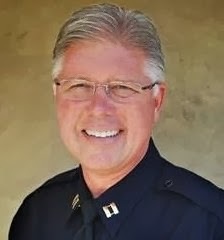 Hartley writes, "Costa Mesa officers have long taken pride in a reputation as one of the best law enforcement agencies in Orange County. Officers were well-trained and the department was always at the forefront of new tactics and technology, be it a search and rescue team or computers in cars. Today officers and some residents say, the department is barely holding its head above water and providing 'minimum' service to residents." Yep, that sounds about right. 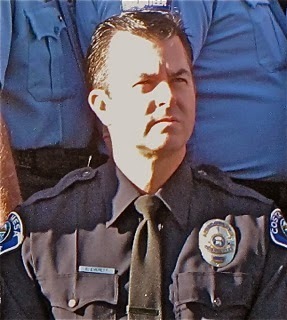 Benjamin is one of three Costa Mesa Police Officers who left for that department. All took pay cuts, longer commutes and pay more for their PERS account. In the "Righeimer" article Hartley begins with this paragraph: "Ask Costa Mesa Mayor Jim Righeimer about problems in the ity Police Department, and he has a ready answer. 'Pure politics.'" And it goes downhill from there. Righeimer is later quoted as saying, "This is all about money. It's all about pensions. It's all about power." 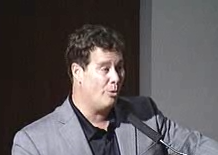 And, of course, he discusses the circumstances surrounding the whole Lackie, Dammeier, McGill & Ether law firm, investigator Chris Lanzillo and the bogus lawsuit filed by Righeimer and Mayor Pro Tem Steve Mensinger. In the "Department struggles" article quotes Gazsi extensively, and outlines the pure statistics of the recent staffing/attrition numbers. He also quotes former president of the police association, Sergeant Ed Everett throughout the articles. In this one Hartley asks Everett why there is a problem recruiting, to which he responds, "The problem is no one wants to come here." Yikes! He then quotes Gazsi, whom he describes as being more diplomatic, as saying, "I think it's because of the challenging political environment." Yep. When addressing the recent authorization by the City Council to add four more officers to the staff Hartley quotes Gazsi as saying, "That's a symbolic first step toward rebuilding the department." Everett has the last word, though. He says, "We're losing more people than we can bring in, unfortunately." This morning I heard that at least five (5) more officers may be actively looking for new jobs. The hemorrhaging continues! For any resident, or any other person interested in the safety and future of Costa Mesa, Eric Hartley's articles in The Current today are "must read" pieces. I'm reluctant to give you more for fear of violating the copyright of the author. Just get up from your chair and go find a news rack in Costa Mesa or Newport Beach and buy the darn Register for these articles! Do it now! Did you every wonder what happens when you throw a party and nobody shows up? 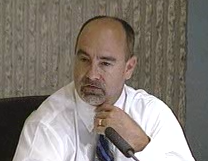 Well, that's kind of what happened Tuesday night at the regular meeting of the Costa Mesa Sanitary District Board. In anticipation of a large turnout to hear the discussion of the proposed Organics Recycling plan and observe the vote on the issue, the Board moved their meeting to the Multipurpose Room at Sonora Elementary School in the Mesa Del Mar section of town. 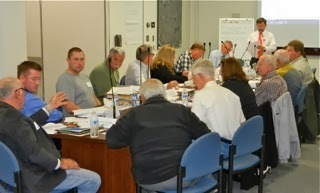 As it turned out, the meeting could have been held in the cozy confines of the Conference Room at District Headquarters. In addition to the Board members, District Staff, representatives of CR&R Environmental Services, Barry Friedland of Costa Mesa Brief (on hand to record the meeting) and Bradley Zint of the Daily Pilot, only 8 residents showed up and only three spoke to the Board on the issue. The short version is that the Board voted unanimously to move forward with the proposal. The actual launch date will be determined later, but it is presumed to occur between November of this year and January of 2015. Details of the actual "roll-out" will be fleshed out as they move forward with more informational town hall meetings throughout the year. 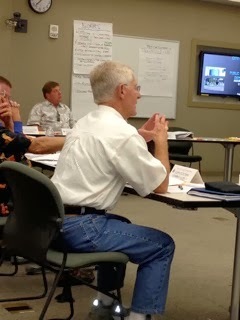 Board President Jim Ferryman indicated that he, personally, would prefer to stick with our current single can system, but times are changing and he felt it was better for the Sanitary District and its ratepayers to be out front on this new plan instead of being caught in the rush to find places to deal with our waste later. Board member Arlene Shafer concurred, indicating that it's better to be first-in with a good rate. 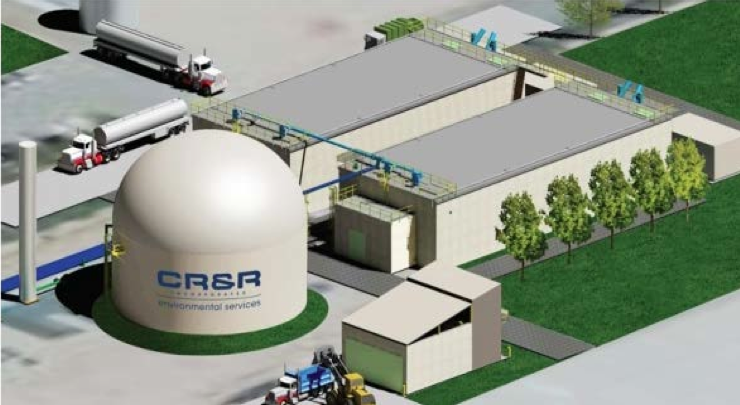 Based on the terms of the contract with CR&R, the Sanitary District will always have the lowest rate. Even if they negotiate a lower rate with other municipalities, our rate will be adjusted to match the lowest. There was no discussion of the cost of this project, although there has been plenty of information made available at the four town halls held over the past few months. According to Scott Carroll, General Manager of the Sanitary District, discussion of any increase in rates will not occur before early next spring. Based on what we've been told in previous meetings, this program will cost an additional $500,000 a year and several options are available to the District to cover that cost, including possible use of reserves. That decision will come at a future date. 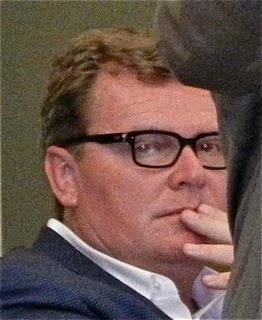 Carroll was clear when he responded to inquiries by members of the public about being able to "opt out" of the program. There is NO automatic "opt out". There may, however, be circumstances that permit a household to have an exemption, but those will be handled on an individual basis. The process for those evaluations will be determined as we move closer to the roll-out date. I was amused that, despite venting his prodigious spleen today with a critical essay as a "guest commentor" on another local blog, former Sanitary District Director Jim Fitzpatrick - apparently a very vocal advocate of plans like this one in the past - failed to show up at this meeting. His hypocrisy knows no bounds. Now the Sanitary District will proceed with more informational meetings and hammer out the details of the implementation of this plan. For details on this program go the Sanitary District web site, HERE, and review the presentations available on the Home Page. UH-OH... IT'S GOING TO RAIN! Today the City of Costa Mesa issued the following release regarding preparations for any possible problems associated with the anticipated severe rainy weather later this week. In anticipation of a major rain storm predicted to hit Friday, the City of Costa Mesa is making free sandbags available to residents and putting emergency crews on standby to deal with any flooding, downed trees, inoperable traffic lights or other weather-related issues. "We don't anticipate any major problems, but we want to be ready just in case," City CEO Tom Hatch said. The city's Public Services Department will have crews clear out the catch basins of storm drains Wednesday and Thursday, and schedule emergency personnel to be on standby Friday and Saturday. The Costa Mesa Fire Department will have an additional four firefighters on duty Friday and Saturday. Costa Mesa residents can fill up to 15 sandbags for free (shovels provided) at the Placentia Fire Station at 2300 Placentia Ave.
As a reminder, if we DO get the rain predicted, don't drive if you don't have to. If you do venture out, DO NOT cross deep standing water! Drive with special care - the oil will percolate up from the streets during the first big rain, making the surface especially slick . Heavy rain will affect your visibility and those of drivers around you. Stay alert! Give plenty of space between you and other drivers. Be courteous about not splashing other cars and pedestrians as you drive through puddles. Be sure you have operating flashlights in your home and cars, just in case the storm results in power outages. Don't forget, this evening, starting at 5:30 p.m., at a special location - the Sonora Elementary School, 966 Sonora Road - as part of their regular meeting the Costa Mesa Sanitary District Board will consider the proposal from CR&R Environmental Services to change the way all ratepayers must handle their trash. It is anticipated that the Board will vote on two items relevant to this change in process. They've held several town halls on this issue - I attended each one and reported on them. There has been plenty of community outreach on this issue. Information in the form of slide shows and a video of one of the town halls is available for view on the Sanitary District web site, HERE. This change will cost more, double the number of trash cans we handle, double the number of trash trucks in our neighborhoods each week and require us, individually, to handle our trash differently. However, having heard all the presentations and listened to questions asked and answered, this seems like a good idea. If you have questions visit the web site or, even better, attend the Board meeting this evening and ask them in person. See you there. As some of you know, former mayor Sandra Genis is back on the city council providing wisdom, experience and intelligence as a counterpoint to some of the tomfoolery being perpetrated by Mayor Jim Righeimer and the rest of the current council majority. Happily, she resurrected her long-dormant blog, La Femme Wonkita, as a platform for expressing her views. In her most recent entry, HERE, she takes on the recent announced attrition numbers for the Costa Mesa Police Department and the apparent lack of understanding by the council majority of what real police work is all about. Her blog entry is a "must read" for all who actually care about the safety and future of this city. 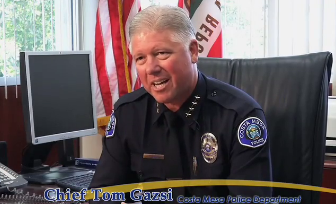 Last Friday Costa Mesa Planning Commissioner Colin McCarthy wrote to City Chief Executive Officer Tom Hatch, with a copy to Contract City Attorney Tom Duarte, expressing his opinion that Costa Mesa Police Chief Tom Gazsi should not be endorsing political candidates. This blast apparently springs from a recent Daily Pilot article in which Gazsi is mentioned as endorsing Newport City Councilman and former mayor, Keith Curry, who is now a candidate for Allan Mansoor's soon-to-be-vacant 74th Assembly seat. McCarthy requested Hatch consider his communication a "formal grievance" - whatever that means. As you might imagine, this has caused a firestorm of controversy. You can read Brad Zint's article in the Daily Pilot on this subject, HERE. He quotes McCarthy extensively, including a follow-up interview in which he quotes McCarthy as stating that Gazsi's endorsement of Curry is "inappropriate". Of course, as is stated in Zint's piece, Gazsi and Curry are friends for more than two decades. Gazsi spent more than 30 years with the Newport Beach Police Department and knew Curry and his wife during that time. After reading the text of McCarthy's letter to Hatch, his subsequent quotations in Zint's article and Chief Gazsi's response, I have a few questions. "Except as otherwise provided by law, or whenever on duty or in uniform, no public safety officer shal be prohibited from engaging, or be coerced or required to engage, in political activity." That seems pretty darn clear to me! 2 - By filing a "formal grievance", does this process now require an investigation? If so, by whom? What penalties, if any, could result from such an investigation? I searched the Costa Mesa Municipal Code and could find nothing about a grievance procedure except as applied in Labor Contracts. 3 - Gazsi says he consulted with the Costa Mesa City Attorney's office before endorsing Curry. One must conclude that he received no guidance to NOT endorse Curry. 4 - I wonder what, if any, action Hatch took upon receiving McCarthy's memo? Did he contact Gazsi on the issue? If so, what did he say? If he criticized and/or reprimanded Gazsi for endorsing Curry, it seems to me that he was violating section 3302(a) of the Government Code (above). DOES GAZSI HAVE LEGAL RECOURSE? 5 - If Hatch DID violate that state statute, what recourse might Gazsi have to protect the rights specifically bestowed upon him as a Police Officer in this city? It seems to me that Gazsi might find the need to seek legal counsel in this matter. 6 - Costa Mesa Taxpayer's Association President Jim Fitzpatrick, who shares the planning commission dais with McCarthy, who also preceded him as President of the CMTA, chimed in with his views. One quote from Zint's article caught my eye. He said, "I support Gazsi, especially at this time when he's trying to change a culture at the CMPD." Really? I pay pretty close attention to what's going on in the city and I don't recall Chief Gazsi ever mentioning changing the culture in the department. Quite the contrary! The recent 60th Birthday Celebration of the department only further solidified the culture and history of an outstanding law enforcement organization. Fitzpatrick and his cronies in the OC GOP for whom he apparently speaks may WISH Gazsi was changing the culture because it certainly clashes with their ideas, but I'm not aware of any directive from Hatch or anyone else to Gazsi to "change the culture" of the CMPD. Since Fitzpatrick has few original thoughts rattling around in his head, I suspect what he's spouting is something he's heard as he snuggles up to his benefactors on the City Council. As I type this the comment thread on the Daily Pilot article is building. Every one to this point is extremely critical of McCarthy on this issue. I think they are correct. This is a petty bit of sniping at a highly-respected law enforcement leader who apparently just happens to support a man that the OC GOP sycophants in this city may not. 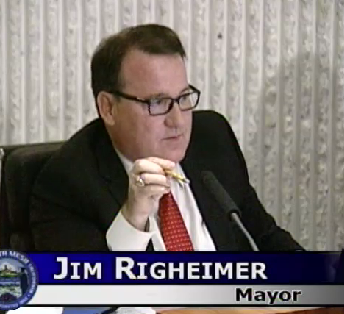 It is well known that Curry and Mayor Jim Righeimer share no affinity for each other. It's easy to presume that McCarthy is voicing a view widely held by Righeimer and other members of his council majority. It's astounding that these guys - Righeimer, his pal, Steve Mensinger, and cronies like McCarthy and Fitzpatrick - continue to jump from cow pie to cow pie, splashing that dung all over themselves. I realize there's probably not a penalty for demonstrating such abject stupidity, but I wonder if a lawyer can be disbarred for advocating the violation of a person's rights as guaranteed to them by state and federal law? Probably not - saying stupid stuff is protected by the same legal protection McCarthy would strip from Chief Gazsi. In my view, this is just one more example of how the men in charge of this city today simply cannot tolerate an opposing viewpoint. Just as Righeimer chose to stifle criticism at council meetings by chiding and mocking speakers and splitting the public comments segment to further inconvenience them, McCarthy would violate Gazsi's rights to keep him from supporting a candidate for state-wide office. This is what happens in third world countries or totalitarian states, not a city in Orange County, California!